Clean, low, medium or high-gain, this one's a banker: the most rock-out, resonant blue-collar PRS we've ever played. PRS style at a great price. It's been a bumper year for PRS, which is fitting as it's the firm's 30th Anniversary. Funny, just like The Rolling Stones' dear ol' Ronnie, PRS will always been seen as the new boy on the block. Still, the Maryland-based company has achieved plenty in the past three decades with its classic Custom 24 - perhaps the definitive hybrid of the Strat and Les Paul - still atop the pile of models they make. But the thing PRS is best known for is the lofty prices it asks for its USA Core guitars. Yes, we have the wonderfully affordable Korean-made SEs but many of us want the 'real thing', don't we? Back in 2013 our prayers were answered with the S2 range. Made in the same factory as the pukka pieces but on a quicker production line with a mix of US and Korean-made parts and a speedier gloss finishing process. But while, the S2s were half the price, and though we had S2 exclusives such as the Mira and Starla, we couldn't shake the 'it's almost a PRS' feeling. Just over a year ago, however, came the Vela, the first S2-specific design, swiftly followed by the all-mahogany, scratchplate-toting Standards. Gradually, the S2s starting heaping on the cool. Enter the new Satin Standards - a Custom 24, Custom 22 and Singlecut, as here. Priced at £999 they're expected to sell for £899 making them the least expensive USA-made PRS guitars. Now, the specs are identical to the gloss Standards; the difference is in the paint - or, rather, the lack of it. Instead of that faster S2 gloss, here we have a nitrocellulose satin finish that doesn't bother with grain filler - you can easily see the body wood's grain and feel it on the neck - for a thinner finish (about a 10th thinner than the S2 gloss), which will wear and age the harder you play it. Plus, thin finishes don't choke any vibrations or resonance. Along with the dot-only fingerboard inlays, this Satin Singlecut looks very workmanlike, but the build and parts still deliver the goods. The body is one-piece mahogany, the neck three-piece. The bridge is the USA Stoptail, the locking tuners, like the pickups, made in Korea to PRS specs. The pattern regular neck is a nice mainstream handful, and setup and intonation are, as ever, top-drawer. 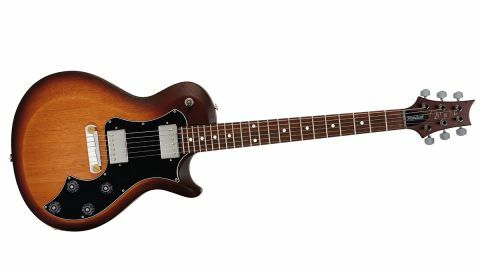 All mahogany guitars - so conventional wisdom attests - can be dark-sounding and here, yes, there's a throaty midrange focus, but a clean-edged ring and resonance that provides clarity and punch, much like the pickups that nail an almost P-90-ish sizzle and classic-rock poke. The four-control layout means there's plenty of adjustment, and the coil-splits on the tone controls add authentic single-coil cut.